Always make me sad when a predator just choose a so beautiful and magnific kind of prey. I also have a photo of Nemoptera bipennis getting eaten by a spider (Aculepeira ceropegia), and I saw a robberfly attacking successfully a beautiful owlfly Libelloides ictericus. Neddless to say that neuropterans are for sure my most favourite kind of insects. 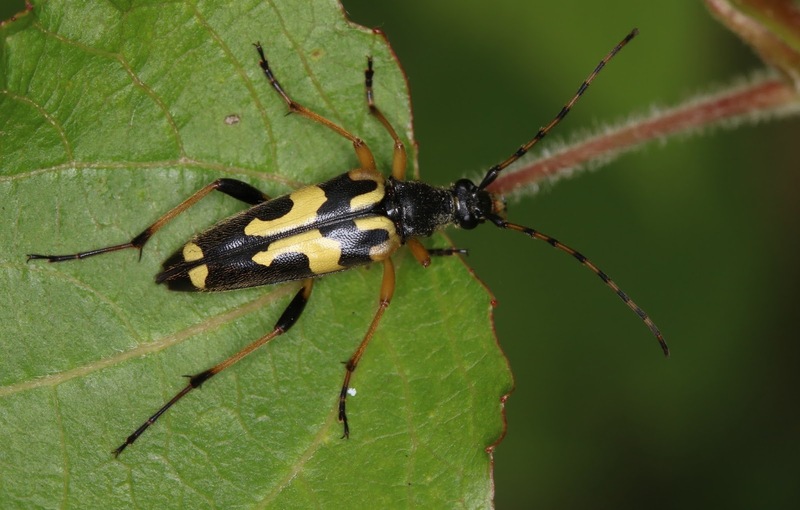 I love these longhorn beetles and there are different pattern variations. This one was found in a wooded area close to my home. Darker (with more extensive black) than the usual for this species. Nice individual. Thanks for the feedback Isidro, yes there are variations with these longhorn beetles. Miniature parasitic wasp (Itchneumon sp) possibly Gasteruption jaculator. I found several of these small wasps in a nearby select area of woodland. I mentioned Ichneumon due to the ovipositor which is visible but quite harmless. Enjoy. Heron On River Trent in Nottingham, England. Such a majestic bird and not afraid of humans too much. It's Gasteruption, but of course not of the jaculator species group, as it have a short oviscapt. Gasteruptiids are completely unrelated with ichneumonid wasps (except for both families being Parasitica). Hi Isidro, thanks for the update, greatly appreciated.